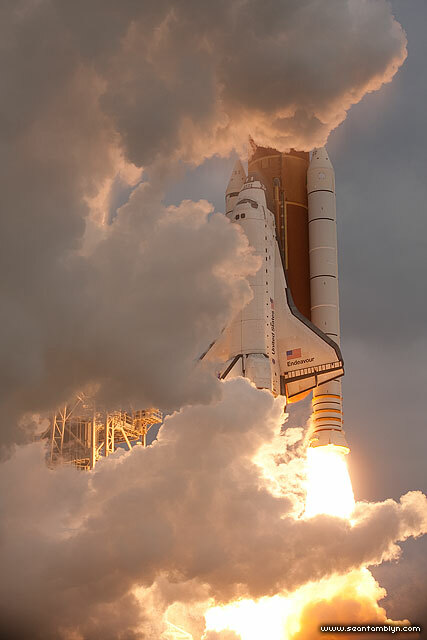 Wreathed in her own launch plume, space shuttle Endeavour lifts off on the final launch of her career, hauling the US $2 billion Alpha Magnetic Spectrometer to the International Space Station. After landing, she’ll be processed and turned over to the California Science Center for permanent display. This entry was posted on Tuesday, January 17th, 2012 at 6:17 pm. It is filed under Areas, STS-134 Endeavour, The Space Shuttle Project and tagged with Canon EF-S 60mm f/2.8, Canon EOS 40D, T-Minus Productions Audio Trigger. You can follow any responses to this entry through the RSS 2.0 feed.